By Deema H in The Mighty. I haven’t quite decided what I think is worse: living with a chronic illness or living with an invisible chronic illness. I’ve come to find people don’t realize it’s offensive, not a compliment, to say, “But you don’t look sick!” Let me tell you something: Looking healthy doesn’t make this any easier. It makes it even harder. It means having to explain in detail why you have to miss class or work. Being registered with disability services is not enough; a quizzical stare is enough to make me start panicking and rattling off information about what I’m dealing with — which, quite frankly, no one should have to do. 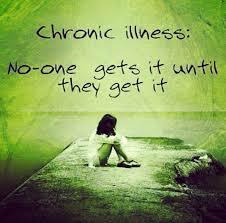 What I wish people understood is being ill does not get easier with time. It gets harder. Your body gets broken down. And then your mental state goes, too. Sure, you may adjust to the physical pain, but you never truly adjust to the sense of panic that sets in — the constant state of anxiety you’re in, waiting for your body to fail you once again. You never get used to feeling like a burden, feeling embarrassed. You never get used to those around you saying, “Again?! Weren’t you just in the hospital?” Yes. Yes, I was. Thank you for the lovely reminder!